It has been awhile since my last post so here's an update. I ordered a new loco from England, it's the National Railway Museums' City of Truro made by Bachmann. It's a lovely loco in GWR green with very fine lining, very handsome in my opinion. When it arrived it ran very well but had a noticeable waddle as it went down the track, this was due to the quartering being out by a small amount and was easily fixed. I'll add all the detail bits and crew once my soundchip arrives from Howes. This first pic shows loco with the rods as they come straight out of the box. The other loco I got is the old Life-Like Proto-2000 S-1 switcher in Maine Central black livery. It was totally an impulse buy but I do love the details and running qualities of the Proto-2000 locos. The only things I've done to it are Kadee couplers, Digitrax chip and the cold-weather windows...it runs like a dream and quiet too...I still have to weather it and see if I can fit a sound-chip into it. Here are a few pics of it. 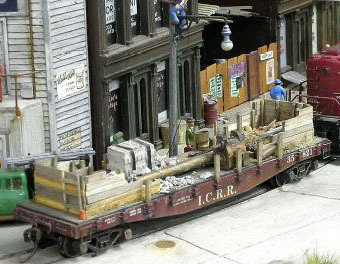 and this pic, of Howard Dwyers award winning diorama was on it. so I decided to build one of my own using one of these, an Athearn 40ft. flatcar. with junk. The secret of course is in the junk and how one weathers it all. Although mine is nowhere as good as Howard Dwyers' in the pic above, I'm sort of pleased with the results for the moment. It looks better than my lousy photo skills might lead you to believe but I intend to keep tweaking it until i feel it approaches something half as good as Howards.